Leonard Walker (1877-1964) studied at the St. John's Wood Art School in London and began to produce stained glass in the 1890s. He used slab glass extensively in his works. This is made by blowing semi-molten glass into a rectangular bottle mould. Its uneven thickness gives a lustrous effect and many subtle colour variations. Walker exploited these qualities in the glass in the execution of his designs. This window came from the Church of St. Lawrence, Brondesbury, north London. 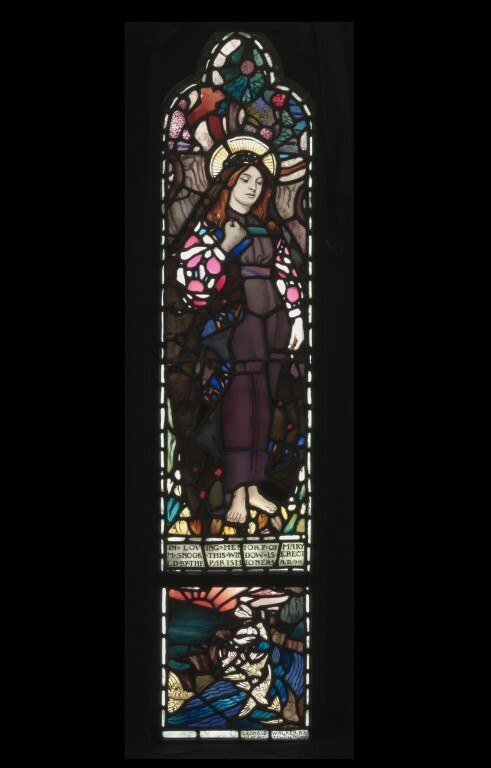 The church was demolished in 1971 and the Church commissioners gave this window and another by Leonard Walker (Museum Number: C.2-1973) to the Victoria & Albert Museum. Unfortunately, no records survive so we can only guess as to the subject of the window. The window depicts a female figure with a halo around her head, which indicates that she is a saint. Beneath the figure is a dedication to Mary M. Snook. W. M. Snook was the curate of St Lawrence between 1906 and 1920 (he died in 1932). We do not know his relationship to Mary Snook, but she was probably his wife or daughter. Quite often people would have special devotions to their patron saint. This makes it likely that the panel represents St Mary Magdalene. Of lancet shape cusped at the top. A standing female figure with a halo above a separate landscape with a setting sun and birds flying over water. Taken from the Church of St. Lawrence, Chevening Road, Brondesbury, north London, when that Church was demolished in 1971. The church was built in 1906 by J.E.K. and J.P. Cutts. W. M. Snook was curate between 1906 and 1920 (died1932). His relationship to Mary Snook is unclear although she was probably his wife or daughter. Leonard Walker (1877-1964) studied at the St. John's Wood Art School, of which he was later to become Principal and began to produce stained glass in the 1890s. 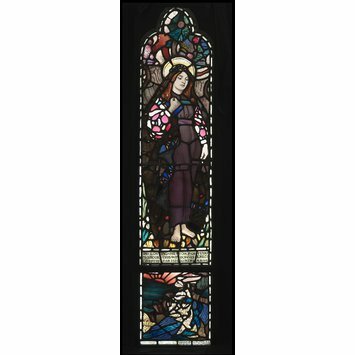 Working within the principoles of the Arts & Crafts movement, his glass is characterised by bold designs and limited use of paint, relying instead on the lines of the leads to create the main outlines. The glass used if particularly uneven texture and colour, giving a richly patterned effect. Leonard Walker employed slab glass extensively in his works. Slab glass is made by blowing semi-molten glass into a rectangular bottle mould. Its uneven thickness gives a lustrous effect and many subtle colour variations. Walker relied heavily on these qualities in the glass in the execution of his designs. In the first half of the nineteenth century, numerous experiments were conducted in an attempt to recreate the medieval methods of making stained glass. Medieval glass is coloured while still in its liquid form with mineral oxides. It is then blown to shape by mouth before being fired in the kiln. Details are added on after this with a copper or iron oxide based pigment and then fired again in the kiln at a lower temperature to fuse the pigment to the glass. From the beginning of the 14th century the glass could have an additional paint layer composed of a silver compound. When fired this turns a lemony yellow to a burnt orange in colour. Contemporaries noted that the making of his glass was a process of infinite experiment in the variations of thickness and tone and of the distribution of simple tints throughout the composition. Walker was a member of the Royal Institute of Painters in Watercolours. He won prizes for the stained glass he exhibited in Paris in the 1920s. Panel of tinted and coloured antique and Norman slab glass with painted details. Depicting a female saint. Made by Leonard Walker, England, 1913. Anon, 'The Future of Stained Glass: Mr. Leonard Walker and his art', Krisson Printing, London, n.d.
Leonard Walker employed slab glass extensively in his works. Slab glass is made by blowing semi-molten glass into a rectangular bottle mould. Its uneven thickness gives a lustrous effect and many subtle colour variations. Memorial window to Mary M. Snook and made for the Baptistery of St. Lawrence, Brondesbury, London.